I'm looking for a good make brand of paint for repainting my myford after being sand blasted. Would I also require a good etch primer any advice gratefully received. Hi Grant The original finish on the Myford was done by filling the castings and smoothing with filler and repeated to look smooth. The filler is quite thick to look corect and if you sandblast the castings you will have to repeat this to get same Finnish. I would look at sanding and filling any damage and spraying on top of original filler. You would not believe how thick the filler can be! I followed David's advice and then used Paragon paint. Take a look at their web site it is full of good advice. I had my lathe cabinet sand blasted, but no other part of the lathe. Hopefully you understand what bits absolutely MUST be protected Grant. Apart from that any good enamel paint will do the job. I use Arcforce enamel off ebay along with their grey zinc phosphate primer. I thought that it would of had filler, I assume its car body filler ? I know that any machine face is precious is there anything else I should watch out for. I will certainly be looking at those paint suppliers you have all mentioned. +1 for Arc force paint. I use Arc Force paint on my machines too. They will do any BS or RAL colour. 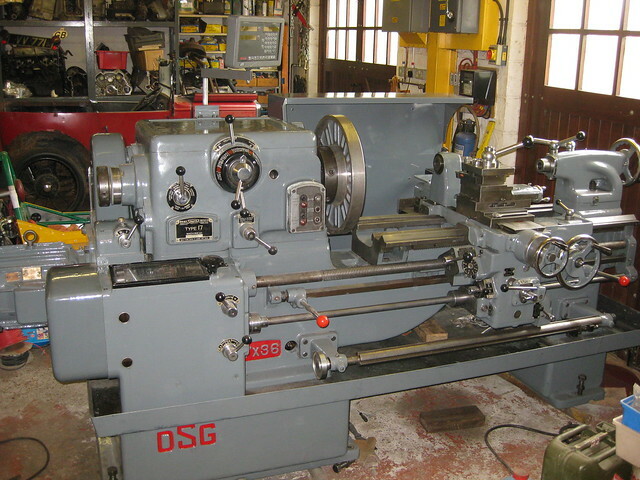 I've recently painted this newish to me lathe as part of the restoration process. This is BS Dark Admiralty Grey. It is basically a spray paint but does brush on OK for smaller stuff. Available here -usual disclaimer. To make the castings look good lots of P38 body filler and elbow grease is required. It's more like dealing with car bodywork than engineering machinery. I would not grit blast anything, preferring thinners and flap wheel grinding discs to strip away the old finish. Blasting in my opinion is just not worth the effort and risk of something getting damaged either in transit or in cleaning. I use Teamac plant and machinery enamel paint on my machines but there's no reason the other enamels mentioned here won't compare just as well. From your advice on here I wont be blasting it I knew it would take it back to metal but looking at the amount of filling to get that smooth finish I'm just going to flap wheel it. Looking at the enamels it brings back memories of the tractor we had and the new Hudson autocycle I restored. It had crossed my mind, acid etch primer brilliant stuff had good results in the past. Tractol enamel is superb for machinery. Tough as old boots. High pigment content and slow drying, so you can get a good finish using brush application. Spaying even better. Available in a huge range of colours. Ferguson grey is a good match for Myford grey. Smith and Allen is a very helpful UK stockist. +1 for Tractol, used it to restore my Denham Junior and Record vice. I've used ready mixed filler on metal before. then a couple of coats of Primer Filler then top coat. I'd use a 2k Acrylic gloss top coat automotive paint on top of 2k filler primer, this gives a very tough gloss top coat that looks like powder coating. Joseph Noci, what Lathe is that in your photo? Back to original post. Plus 1 for Tractol paint. I used a company on ebay called Paints4trade, very knowledgeable, they can make anything you want. You can also get Toluene and other useful solvents for cleaning really stubborn grease/grime stains. The enamel paint I bought was specifically for plant and machinery and was Xylene based. Just go easy on the Xylene and Toluene as they are a bit toxic, affects the nervous systems etc. Well ventilated area needed! Tractol is a Xylene based enamel paint too. 'Enamel' is another of those words that's bent it's meaning over time and space. Originally 'enamel' was a baked on coating, heatproof, very hard and durable, applied to domestic ovens and cast-iron baths etc. Usually but not necessarily white. Expensive, can be done on a small scale, but really needs a largish kiln. Still found on posh cookware. Later 'enamel' came to include 'hard wearing paints that look like real enamel', or, less desirably, 'any soft paint that looks a bit like real enamel'. Usually in the UK the hard wearing definition is what's meant, but what's available ranges between high-performance 2-part paints, and cheaper, less tough, mixtures. It is also possible to buy 'enamel' paints that aren't hard-wearing at all, making Grant's question a good one. Dave, I would have to put my pedant hat on, and challenge you on that. The first type you refer to has traditionally been referred to as stove enamelling. It still very much exists, and sits side by side with other (non baked) enamels. Whilst I agree that the second is a catch all encompassing many types of 'enamel', it is still true that there is a separation, as there always has been, between baked stove enamel, and air drying (all the others).